To improve our view of a vast and complex universe, scientists are creating increasingly ambitious new tools. The work is not easy. Truly big science requires decades of expensive commitment from multiple nations. But the instruments that result are nearly as awe-inspiring as the new worlds they help us discover. Like anything that’s large and involved, big science is not easy to measure. For our rankings, we took into account four objective factors: the construction costs above all, but also the operating budget, the size of the staff and the physical size of the project itself. Even these were hard to compare on an apples-to-apples basis, though, so we also used a tiering system. Then we added in three subjective factors, weighing them more heavily to reflect their relative importance: the project’s scientific utility, its utility to the average person (“what will it do for me”) and the always essential “wow” factor. For a complete explanation of our scoring, click here. The RHIC, on Long Island, N.Y., smashes gold ions into each other, producing temperatures of up to 7.2 trillion degrees Fahrenheit — so hot that protons and neutrons melt. Why? So scientists can re-create the conditions that existed during the first millionth of a second after the Big Bang. 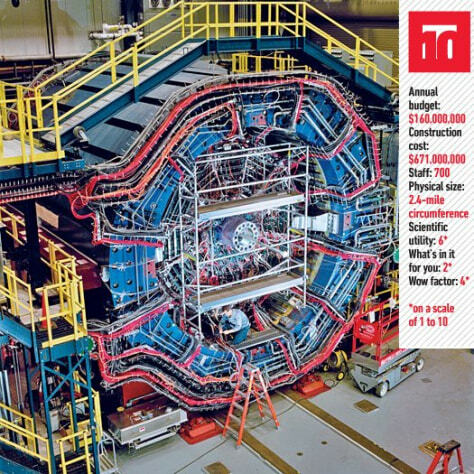 Read more about the RHIC's time-machine-like abilities here. A massive ocean observatory network that includes some 530 miles of cable and 130 instruments with 400 sensors, is designed to provide the first large-scale, around-the-clock monitoring of an ocean system. That includes animal life, geology, and chemistry. 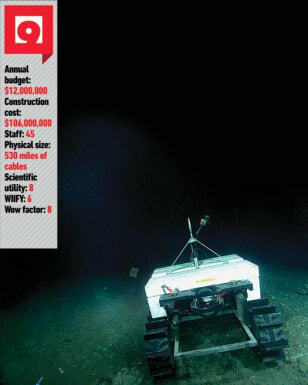 Read more about Neptune's battery of networked instruments here. 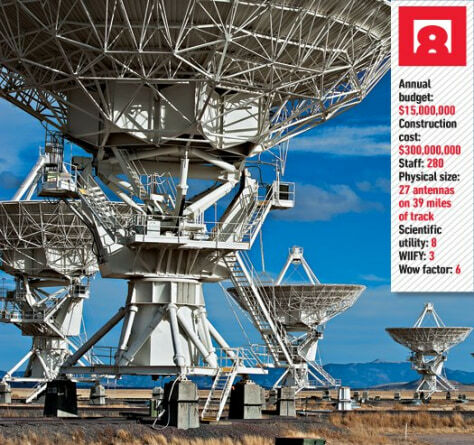 One of the largest telescopes in the world, the VLA has 27 individual radio antennas, each of which is 82 feet in diameter. It needs that kind of muscle to create detailed images of celestial objects as close as the moon — or as far away as the edge of the observable universe. Read more about the VLA's use to you — like predicting an asteroid strike — here. 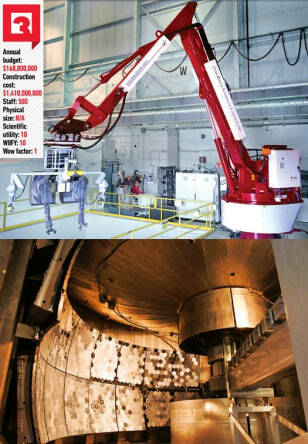 The world's largest and most energetic laser, Livermore, CA's National Ignition Facility stands 10 stories tall and generates 2 million joules of ultraviolet energy. It's capable of reaching temperatures and pressures similar to those found in the cores of stars. 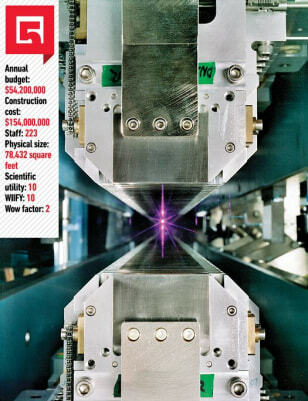 Read more about this ridiculously powerful laser here. Juno will enter Jupiter's orbit in 2016, but before then, it'll reach speeds of 134,000 miles per hour — one of the fastest human-made objects ever built. It'll make 33 passes around the planet, then commit suicide by diving directly into it, burning up like a meteor in Jupiter's hydrogen atmosphere. 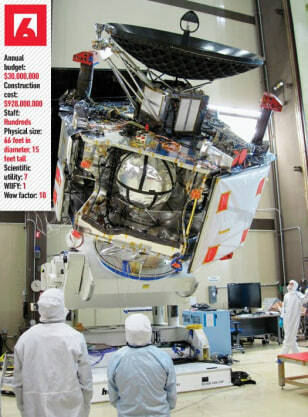 Read more about Juno's noble mission here. A Berkeley, CA-based particle accelerator, the ALS beams photons a million times as bright as the sun's surface into proteins, battery electrodes, superconductors and other materials to reveal their atomic, molecular and electronic properties. It's helped show the 3-D structure of RNA plymerase enzymes and described the dust from a comet's tail. Read more about this "ultimate microscope" here. 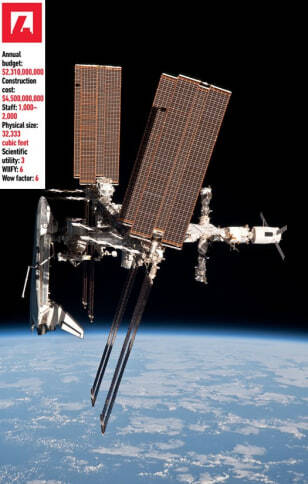 What's left to say about the ISS? It costs $2 billion a year and thousands of employees just to keep the lights on, and has supported the longest continuous human presence in space: 11 years this November. It's not just space fun, either: research on the ISS has led to the discovery of salmonella vaccines, too. Read more about this long-lasting space presence here. A sort of ludicrously powerful movie camera for molecules, the SNS has a particle accelerator that shoots bursts (to the tune of 2 quadrillion neutrons per pulse) into a chamber to reflect off of materials. But it doesn't create explosions; the SNS is better suited to figure out how to create objects like, say, better batteries. 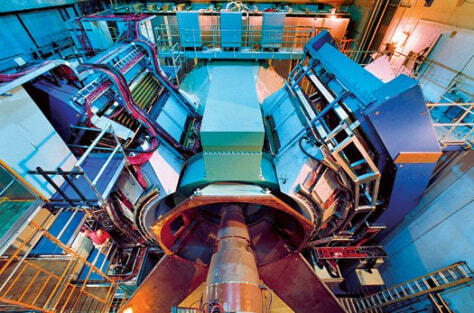 Read more about this neutron accelerator here. Ah, of course, the world's largest particle collider. 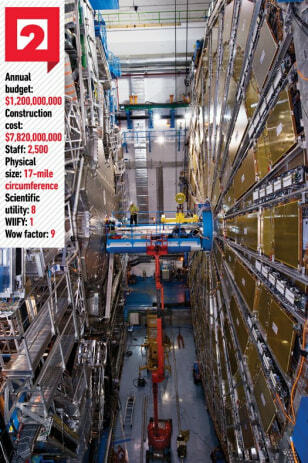 It costs about $1 billion annually to run, more than 10,000 employees from 60 continents toil on it, and the whole thing is designed to unlock the fundamental physical secrets of the universe. Lately: Does the Higgs boson, commonly referred to as the "God Particle," actually exist? Read more about the LHC and its quest to learn about dark matter and the origin of the universe here. 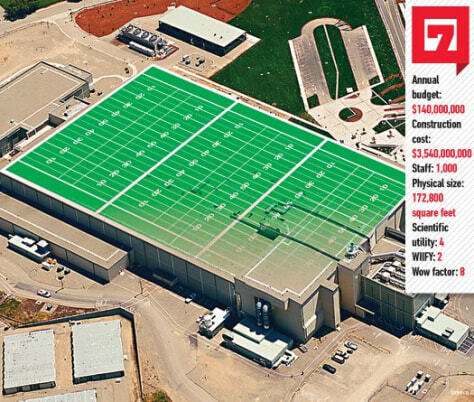 The Earthscope is the world's largest science project. 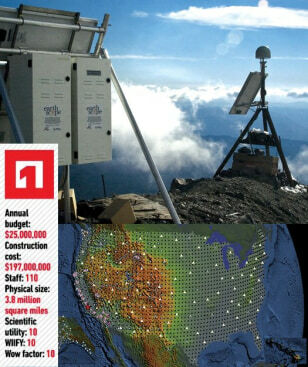 Designed to track North America's geological evolution, this observatory records data over 3.8 million square miles, amassing 67 terabytes of data. It analyzes seismic slips in the San Andreas fault, sure, but also the plume of magma underneath Yellowstone and much, much more. Read more about the telescope that peers into the heart of our planet here.